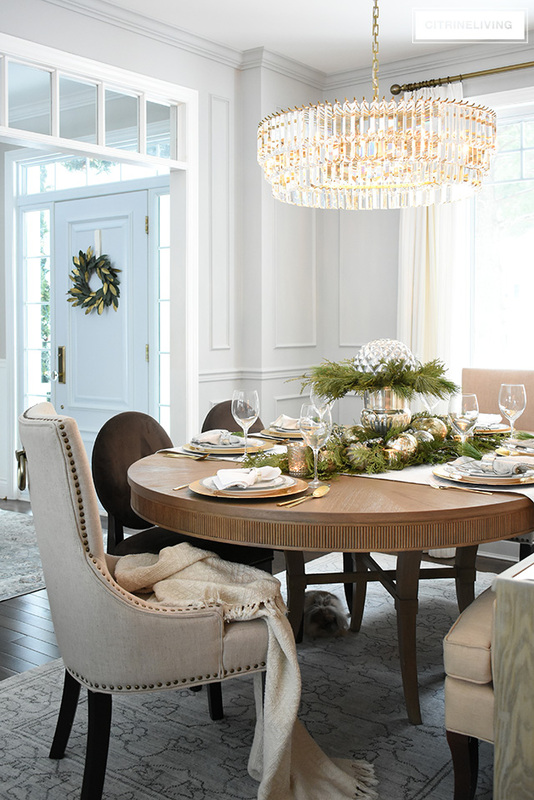 Our dining room, as many of you know, has undergone a mini makeover and while I should be revealing it to you today, you’re only going to get a few little sneak peeks like you did a few weeks ago! I hope it’s not too anti-climactic when I share the actual reveal! I’m not quite there just yet, but I will be so soon! 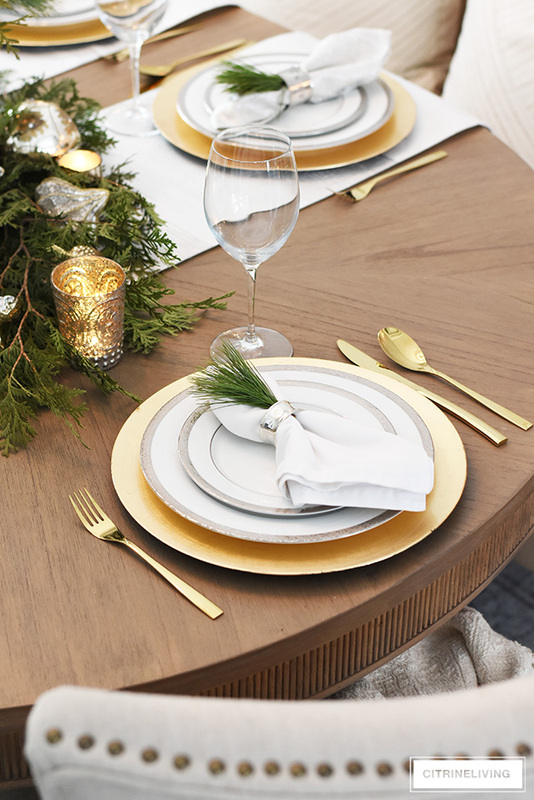 Today I’m sharing my Christmas table with fresh greenery and beautiful ornaments, and I’m going to walk you through how easy this is to create – in minutes. 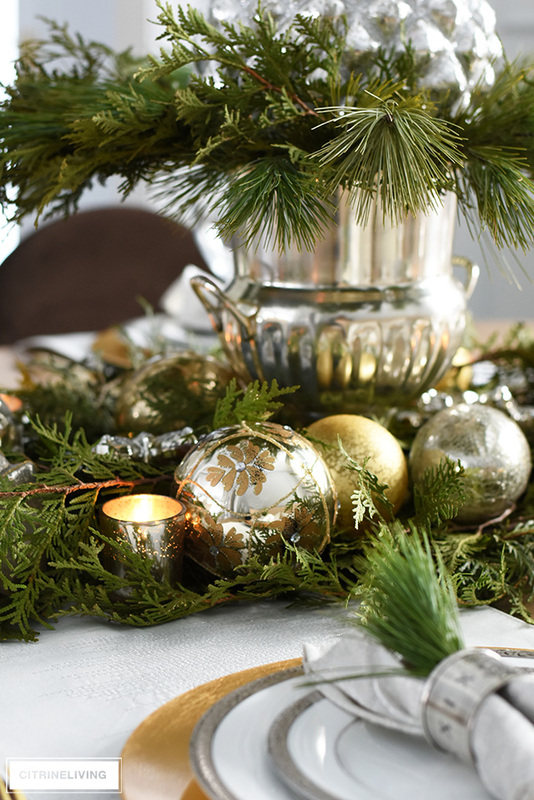 I’m all about expediency – I don’t have a lot of time for elaborate decorating and party prep! So I’m very happy to share how simple this is to create! I’m also very happy to be a part of the Styled + Set Holiday blog tour, hosted by my very talented friend, Lory, of Designthusiasm. Lory works so hard putting these tours together and I’m always so grateful to be a part of them! if you’re coming over from Sheila of Maison de Cinq, I’m thrilled you’re here, welcome! 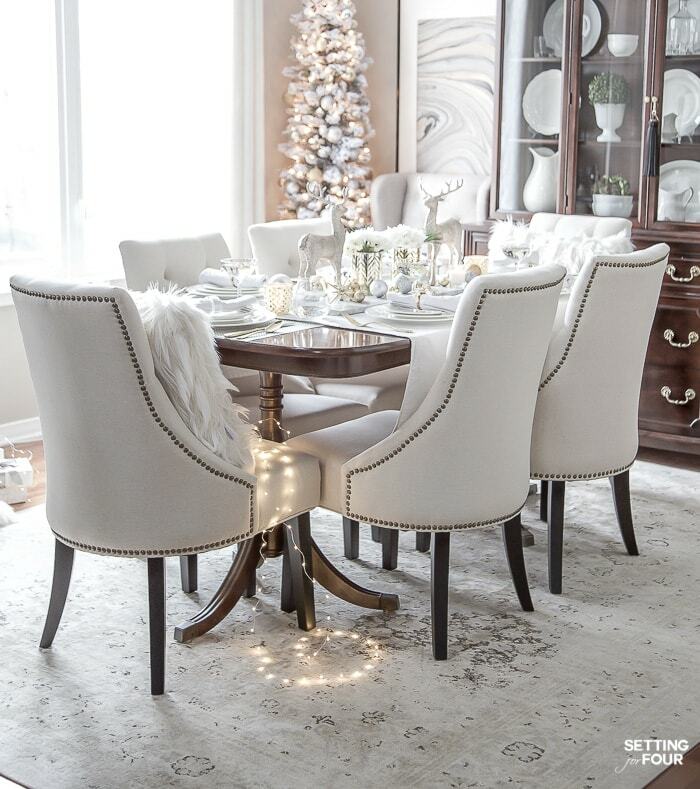 I love Sheila’s gorgeous French vintage style and her tables are always beautiful! I’m touring today with a group of fabulous gals, please be sure to visit them too – you can find the links at the bottom of my post, along with the lineup for the whole week. Let’s get to it, shall we? 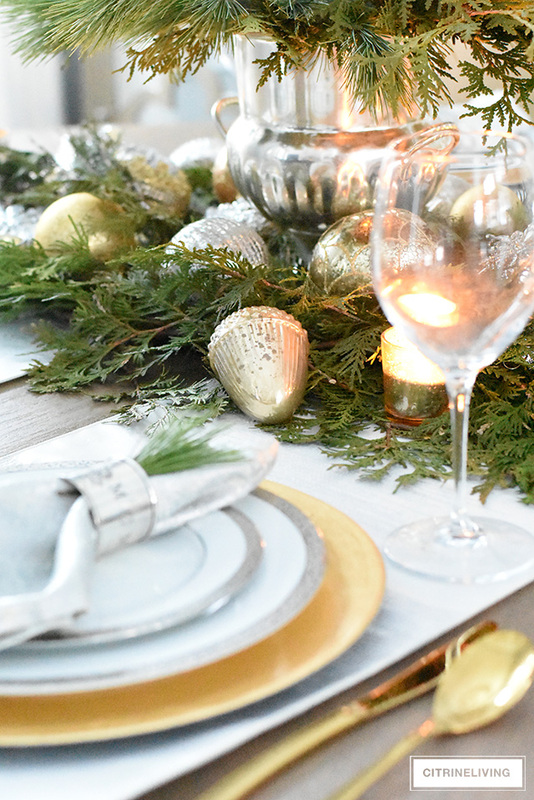 I think you’ll find today’s tablescape not only beautiful, but also inspiring because it’s so simple to create. I’m going to admit something – when I created this table last week for this tour, I had very little time to come up with a concept that I knew I would love and wanted to share. I needed something that was quick and simple to create, but it had to be beautiful, and also something I can easily recreate on Christmas day, when everyone comes over to celebrate. 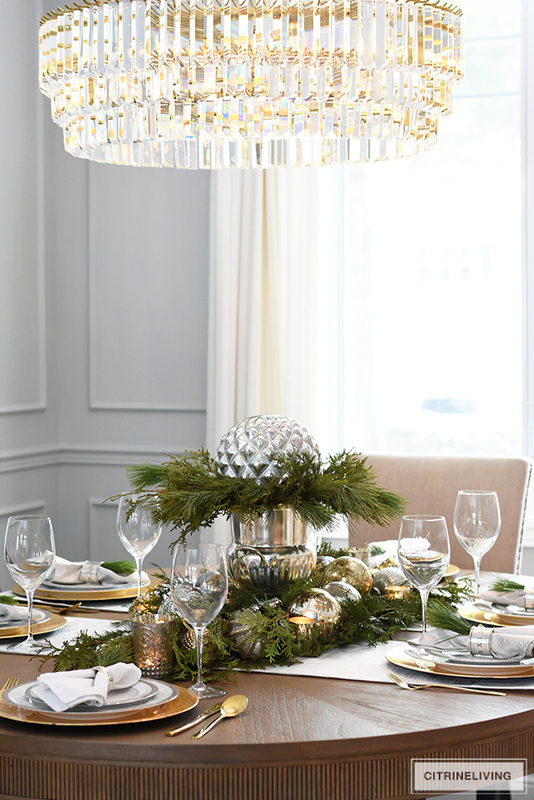 This year, I’m sticking mainly to silver and gold throughout our home, and I’m loving the look in our new dining room with the fresh greenery. 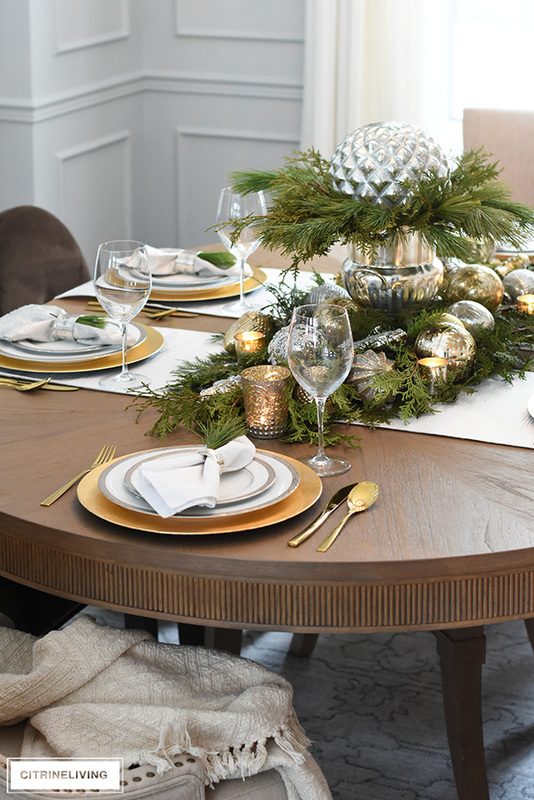 I’m quite happy with how this tablescape turned out, and this would be gorgeous with any color scheme for the holidays. 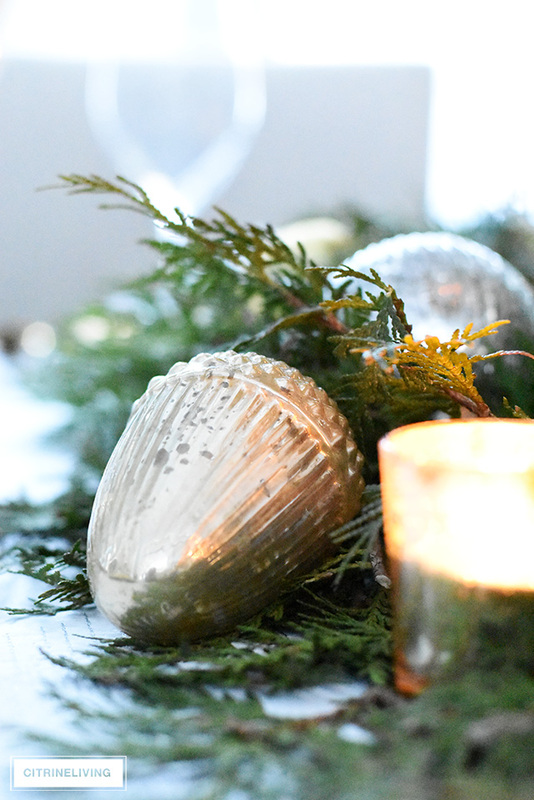 Last year I used navy and green tartan, gold and silver on my table – you can visit that post here. Buy fresh-cut greenery from your local florist, farm, nursery, grocery store, or big box store – I used Cedar and Eastern White Pine. Place your container in the center of the table. Arrange the Cedar so that the stems are facing the container, laying along each side. Layer your greenery, working around your container toward the center, tucking the stems underneath as mush as possible. Be sure to layer as evenly as possible on both sides of your container, for a symmetrical look. 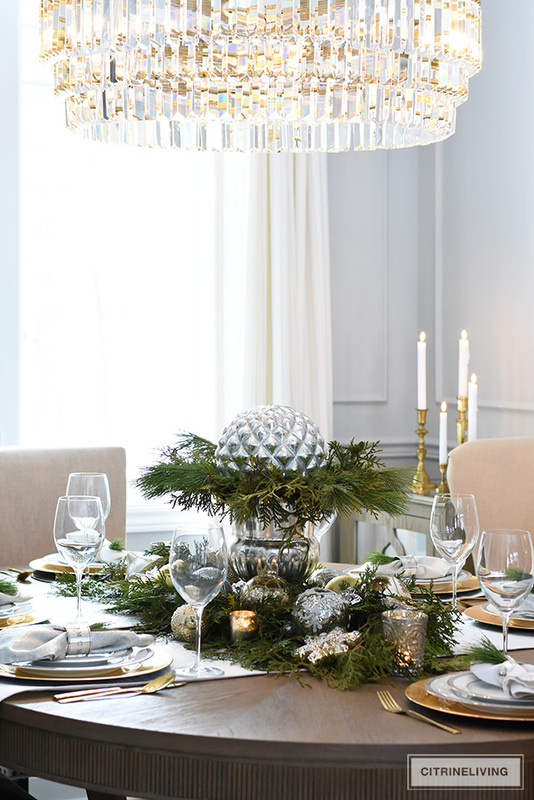 Layer your ornaments throughout the greenery, nestling some in. Try using different sizes and kinds for visual interest. 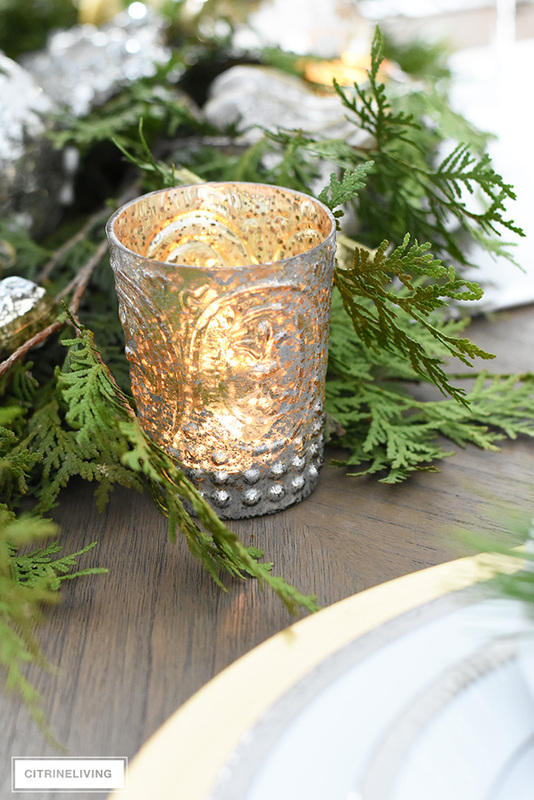 Layer votive candles throughout the greenery, with one at each end as well – please make sure that nothing is near an open flame! Fill your container with water, then arrange the Cedar, working all the way around so there are no gaps in between. 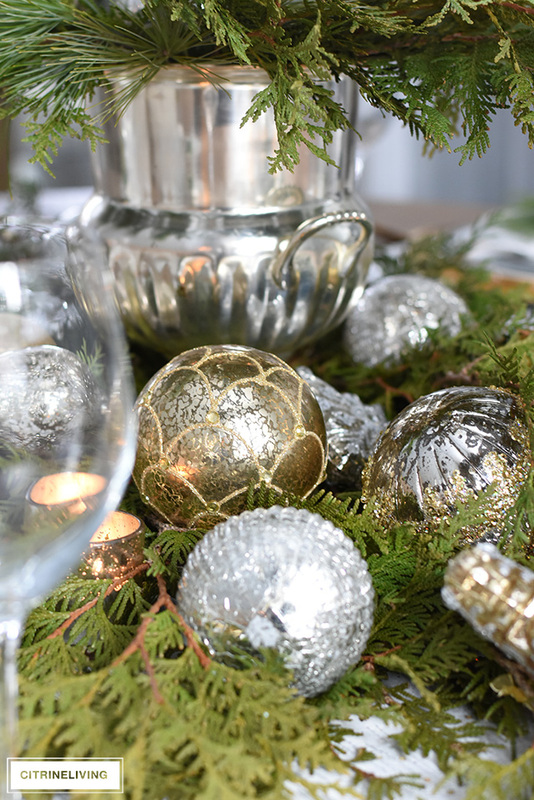 Arrange the center with flowers, a large ornament as I have, or fill with more greenery. 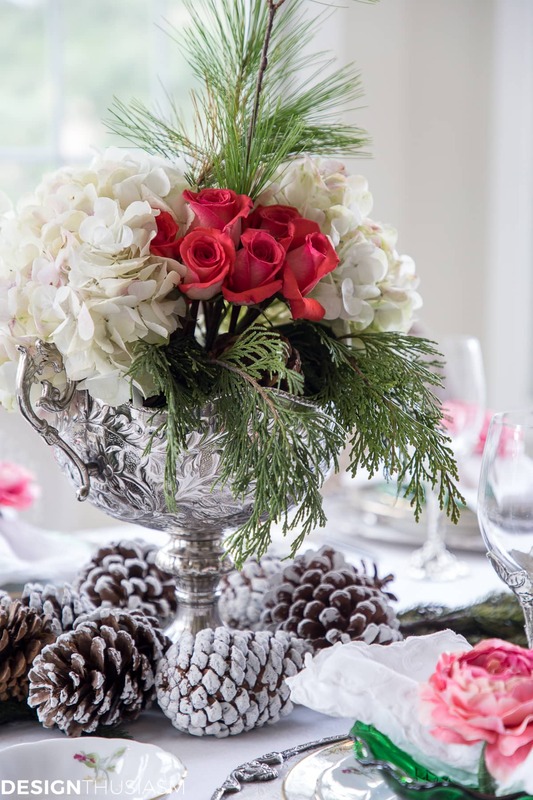 Tuck sprigs of Eastern Pine (or another kind of greenery) throughout the arrangement for variation, if desired. 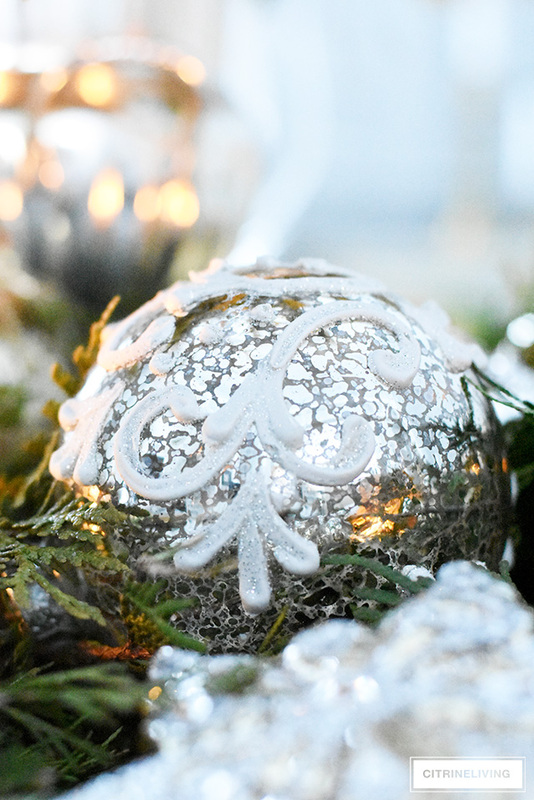 I’ve collected so many ornaments over the years, which are all mostly white, silver and gold. 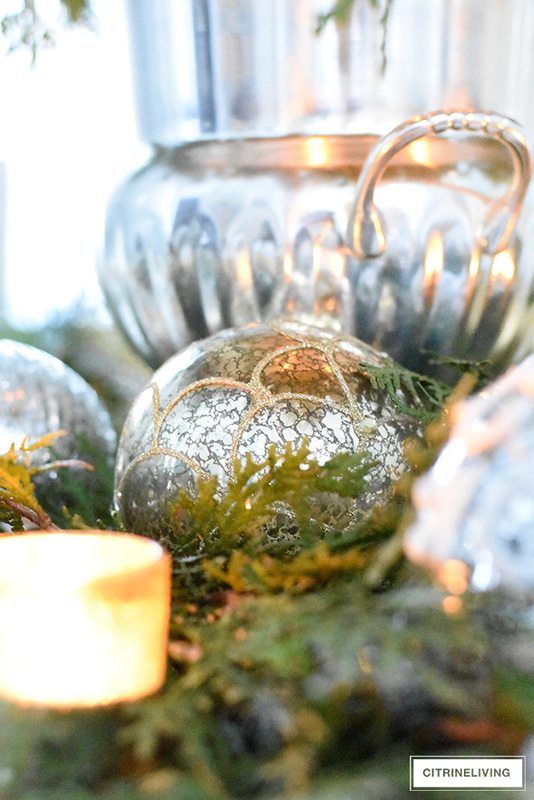 I love to have unique, one of a kind ornaments, they add so much character to your holiday decor. Anything vintage-inspired, metallic, or mercury glass always gets me! Everyone loves a little shine and sparkle, right? 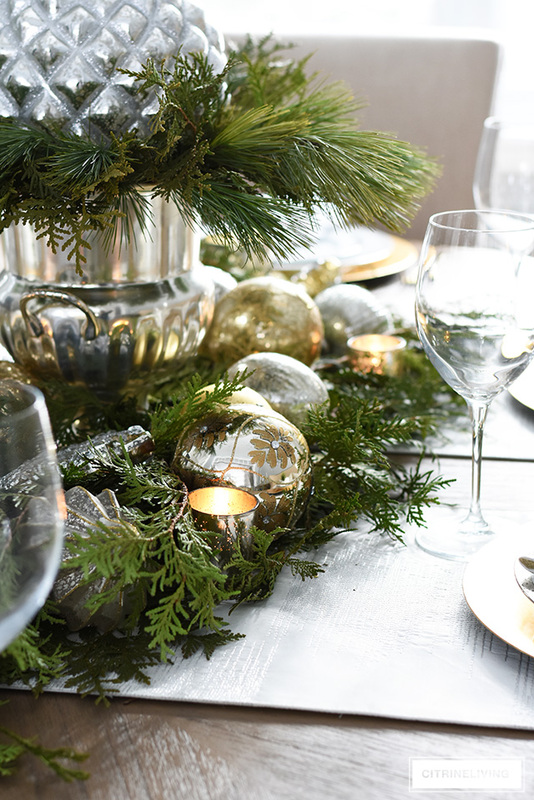 What I love is the juxtaposition of all that glittery goodness paired with the rustic, earthy greenery. 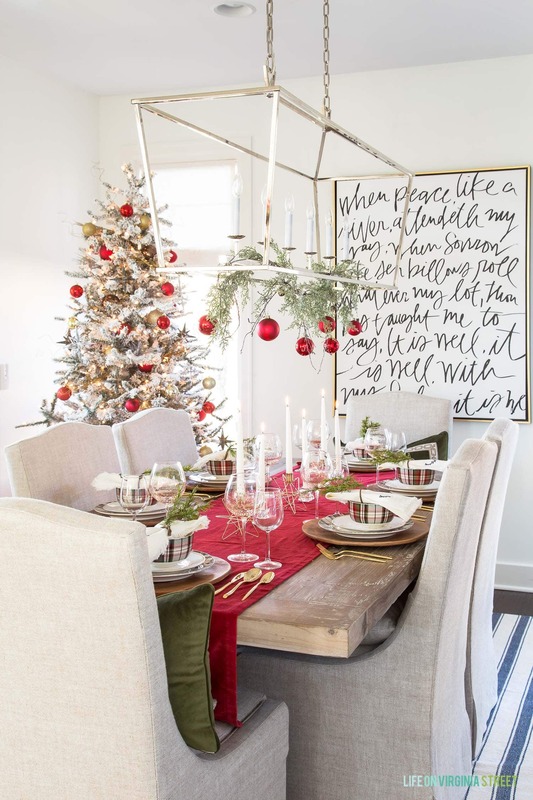 I often love to create a little tension of sorts with my decor – this is a great way to do that! 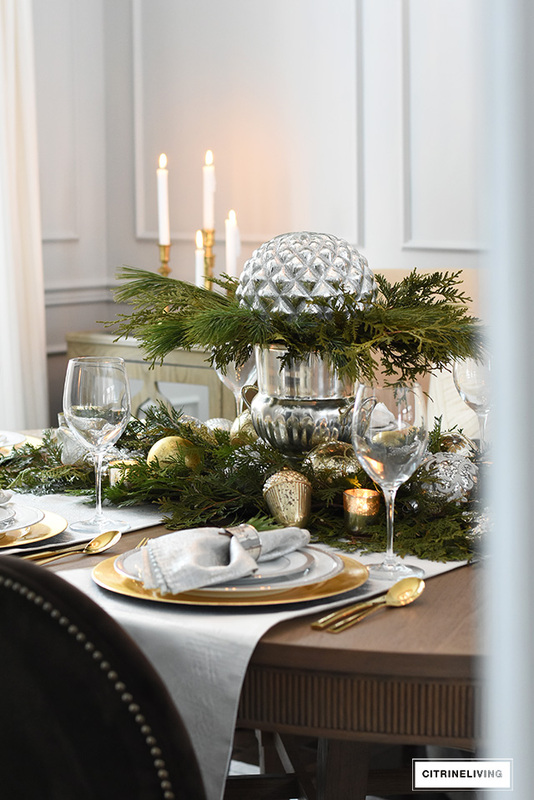 I picked up these beautiful French-inspired votives at HomeSense, and they’re perfect for Christmas decorating. I used one of these at each end of the centrepiece. 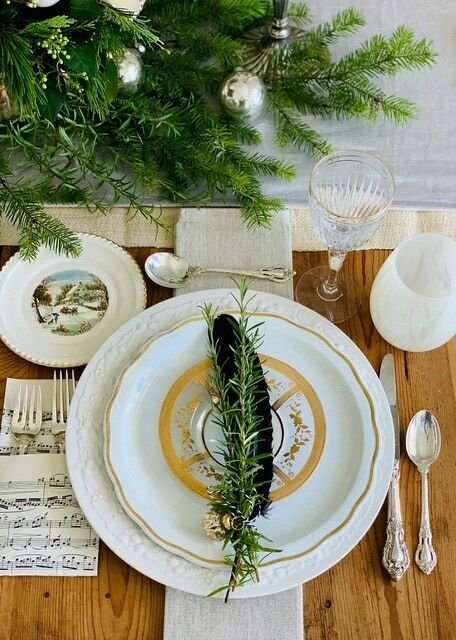 I also tucked in four more mercury galss votives around the greenery, using one at each place setting. This table honestly took me about an hour at the most to arrange – if even that! There’s no science to it, you just arrange everything so it’s pleasing to you! The greenery will last a good week or two before it starts to dry out – so make sure if you plan to keep it out for a long time, that you’re replacing it. It should also last longer in water, so fill any containers filled with greens. I got very lucky this year, I found all of my fresh greenery at a local farm and this whole table cost me $5, if you can believe it! I bought one bundle of Cedar for this table, and four bundles of English Pine for our front porch arrangements, for $5 each! I snipped a few bits of the English Pine to add in here, but that was it. I already own all of the ornaments – definitely a win-win for me! 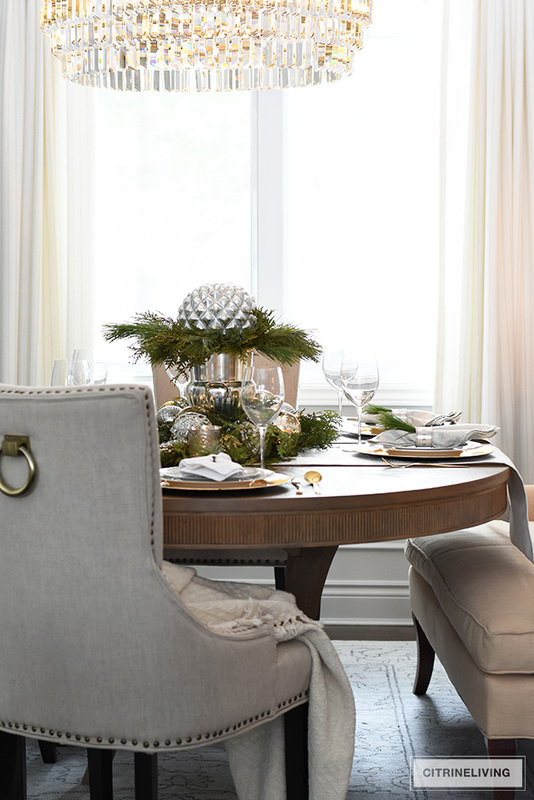 I especially love this look and these colors against our new grey walls, painted in Benjamin Moore Stonington Gray. 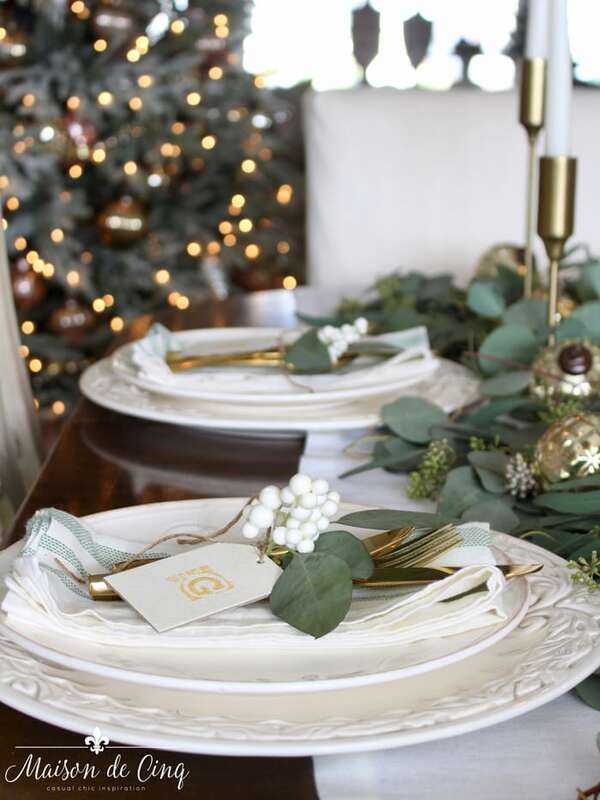 I kept the place settings simple, using my go-to white and silver china, gold chargers and flatware. 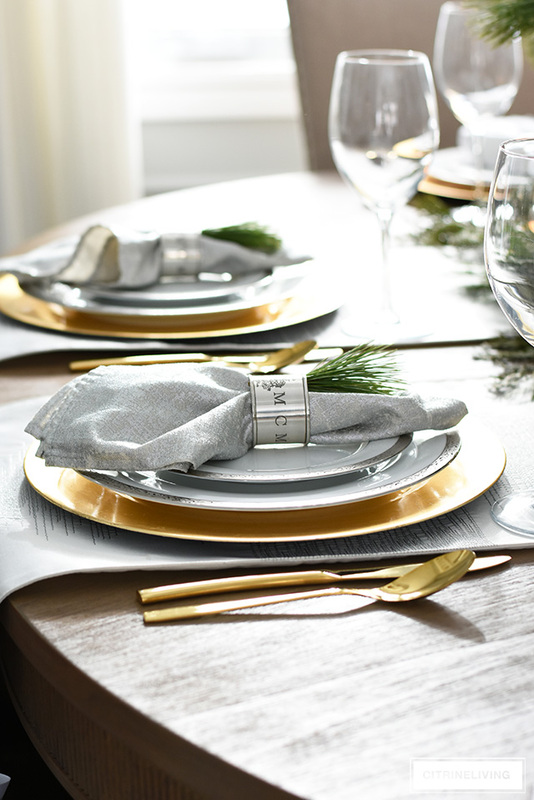 I recently received these beautiful napkin rings, which I shared in my Holiday Entertaining Essentials post (read it here), and I absolutely love their vintage charm. 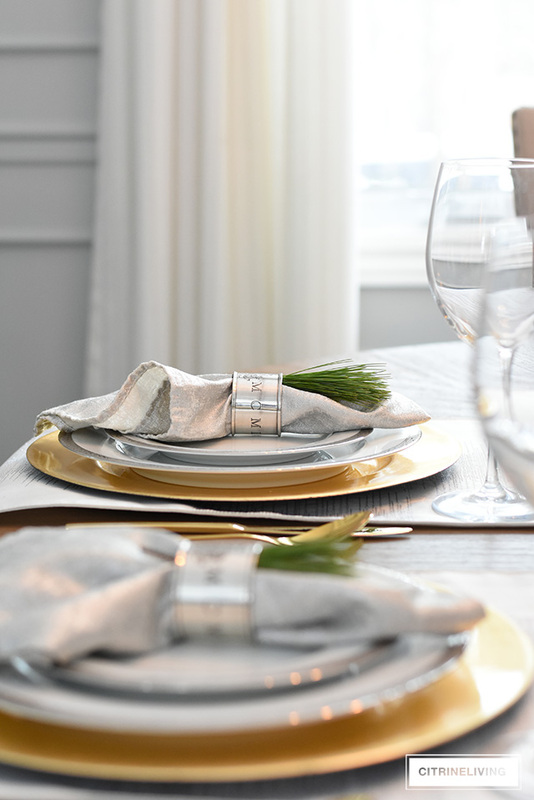 Since I only have four of the vintage-inspired napkin rings, I used two of my classic silver rings at the ends – many of my sets are in fours, so I always love to create something a little different at the ends of the table. Firstly, because I have to, if I only have four of something, and secondly, I also love the variation it brings to the table. « HOLIDAY GIFT GUIDES AND HUGE CYBER SALES! Tamra, This is a lovely classic and timeless look, which I’m all about. I too have many collected ornaments and this is a great way to showcase them, And the fresh greens just speak Christmas to me! Thanks for sharing your lovely home with us. So beautiful, Tamara! I love the greenery and all your tips. So elegant and classic.